There is any number of kimchi recipes, all with their own cultural, family and personal special touch. The same goes for the kimchi paste that can be done either with the traditional Korean chili powder Guchugaru, or any other chili powder of your choice. 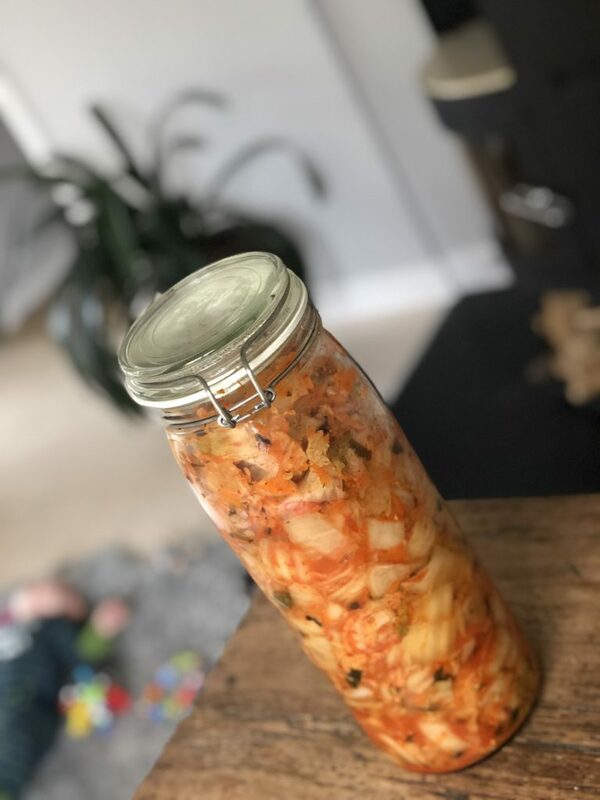 Kimchi is probably the one among all fermentations that has the most variations, so allow yourself to be free and flexible to explore and create your very own personal kimchi. Before you make the actual kimchi you need to make the kimchi paste. You find the recipe for the kimchi paste here. 40g coarse salt, plus extra salt for the salt water. Prepare the kimchi paste so that it is ready. Remove the outer leaves on the cabbage and rinse thoroughly. Save them for later. 12h before preparing the kimchi, you make a 5% pickle brine (salt water) (50g salt /1L boiling water). Make sure you make enough brine in order to cover the cabbage. Place the cabbage in a large bowl, pour room temperate brine/salt water, enough to cover the cabbage. Top it off with a plate to keep all the cabbage cover by water. This is preferably done in the evening in order to make the kimchi the next morning. Put a towel over the bowl and set aside in room temp. After 12h you pick the cabbage and rinse thoroughly in a strainer to rid it off all excessive salt. Cut the stem of the cabbage and cut the rest in fours, that you then cut in 2-inch pieces. Rinse the carrots with skin, cut the top off and shred roughly. Rinse the daikon, cut the top off and slice thinly. Rinse the spring onions and cut rough. Weigh the veggies, salt and kimchi paste. Place it all into a large bowl. Put on your plastic gloves to protect your hands from the spicy chili, and massage the ingredients for 5-10 min until they mix thoroughly and release liquid. Por the mixture into the mason jar with the liquid. With your hands, press it all into the jar, until the liquid covers it all. If you gave it a good massage the liquid should be enough, but if not you can use some of the prickle brindle. Use the saved cabbage leaves and fold them to fit the mason jar. Place them over the kimchi mix and press it all under the liquid. Make sure there is about 1-1/2 inch of air at the top jar, close the lid and place onto a tray in a dark and warm place. Let it ferment for 4-7 days, preferably in 18-20C. If it is warmer the ferment will go faster; if colder, slower. Open the lid every day to fart the pressure that is created during the fermentation. It’s important to finish the fermentation process while the kimchi is still bubbling, and before lactobacillus makes the mix sour. Taste the kimchi after 4 days, or earlier depending on room temp, and every day until day 7 when the kimchi should be ready. Place the kimchi into the fridge. ready to serve!